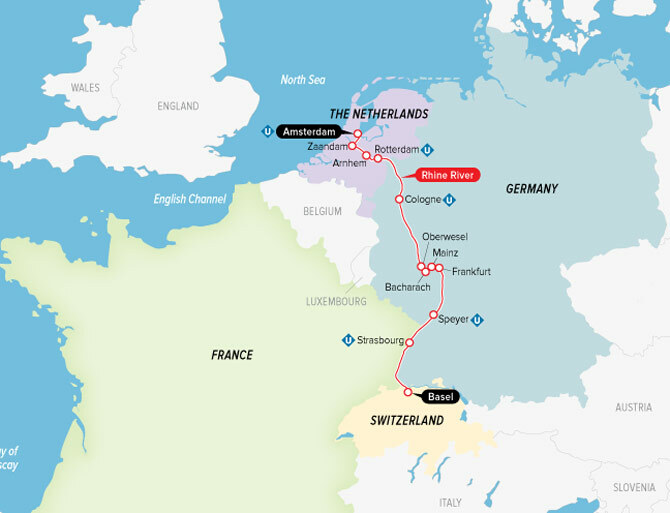 Explore Europe’s rich history and Jewish heritage on an incredible discovery of The Netherlands, Germany, France and Switzerland. Dive deep into the region’s culture, natural wonders, traditions and historical significance in a one-of-a-kind experience along the Rhine. Delve into the region’s world-renowned museums in Amsterdam, Frankfurt, Cologne, Basel and Arnhem. Along the way, indulge in Central Europe’s delicious cuisine—Dutch cheese and fries, Alsatian choux-croute, Swiss-style sausages, Kölsch beer, unique wine vinegar aperitifs and Germany’s famous white wines. Not only that, but you’ll discover Central Europe’s fascinating Jewish ties as part of our Jewish Heritage program—the only itinerary of its kind offered on the rivers. Oh, and did we mention the scenery? Standing on the top deck of your ship, watching the ever-changing landscape turn increasingly dramatic, you’ll understand why people have been raving about the Rhine River Valley for centuries - and there’s definitely no cause to stop. You’ll spend your day exploring Rotterdam’s historic splendor, vibrant culture, varied architectural landscape and maritime heritage. Embark on a stroll around the port city’s most enticing spots, like Market Hall. The impressive residential and office building is adorned with a futuristic, all-glass façade, doubling as an art installation of sorts. While you’re in the heart of the city, you’ll stop along the way to sample mouthwatering Dutch pastries. Later, venture to the nearby village of Kinderjik and marvel at a group of 19 towering windmills. The World Heritage Site holds the largest concentration of old windmills in The Netherlands and its entire vicinity is a protected village view. Rotterdam is the “Gateway to Europe” and you’ll want to discover why. Or you can choose to join a walking tour exploring Rotterdam's profound Jewish history and heritage.